Shih YF, Yu HT, Chen WY, Liao KK, Lin HC, Yang YR. The effect of additional joint mobilization on neuromuscular performance in individuals with functional ankle instability. Phys Ther Sport. 2018; 30:22-28. The benefits of manual therapy and the mechanisms by which manual therapy results in improved patient outcomes have come under increased scrutiny in the literature.1 While investigators have failed to provide strong evidence for the biomechanical effects of manual therapy, the focus has shifted somewhat to the neurophysiological mechanisms that may be at play.2,3 Studies in patients with functional ankle instability (FAI) have reported alterations in muscle activation patterns and balance control strategies indicating proprioceptive and neuromuscular control deficits.4 Some researchers have associated ankle dorsiflexion range of motion (ROM) deficits with the reported postural control deficits.5,6 The authors of this study designed a randomized controlled trial to examine the effects of a four-week talocrural joint (TCJ) mobilization combined with neuromuscular training on function, ROM and balance performance in subjects with FAI. Methods: Forty-five subjects, age 20-50, participated in this study. All subjects had FAI, defined as a history of at least one ankle sprain in the last year with residual symptoms or a history of multiple sprains over the last year with reports of “giving way” in the last three months. Subjects were randomly assigned to one of three groups: control group (CG), neuromuscular training group (TG), and TCJ mobilization with neuromuscular training group (MTG). Subjects who were excluded had a history of fracture or surgery, acute ankle sprain (within the last 6 weeks) or evidence of physiologic laxity (positive anterior drawer or talar tilt test). Investigators collected data on ankle dorsiflexion range of motion (DFROM), peroneus longus (PL), tibialis anterior (TA) and soleus (SOL) muscle activity and reach distance during the Y-balance test. Subjects also reported on pain and function with the Cumberland Ankle Instability Tool (CAIT) and on overall change with the Global rating scale (GRS). The intervention period was four weeks. The CG received verbal instructions on ankle stretching on the day of the initial assessment. The TG underwent eight 15-20 minutes sessions of supervised neuromuscular training followed by a 15-minute sham joint mobilization (gentle skin traction with no joint mobilization) over the four-week period. The MTG subjects received the identical neuromuscular training as the TG, as well as eight 15-minute sessions of TCJ mobilization. The mobilization included end-range TCJ traction for 5 minutes (Figure 1), two minutes of grade III and two minutes of grade IV posterior mobilization of the talus (Figure 2), and two minutes of grade III and two minutes of grade IV mobilization to the distal tibiofibular joint (Figure 3). Subjects were given a one-minute rest between the grade III and IV mobilizations. The neuromuscular training program for the TG and the MTG included bilateral and unilateral tasks of static and dynamic balance activities on a variety of surfaces. All subjects performed gastrocnemius and soleus strengthening, as well as a home exercise program of calf stretching, three times a day, 30-second hold, five times per week. Figure 2. Posterior mobilization of the talus – anterior to posterior mobilization to the talus with both hands moving posteriorly. 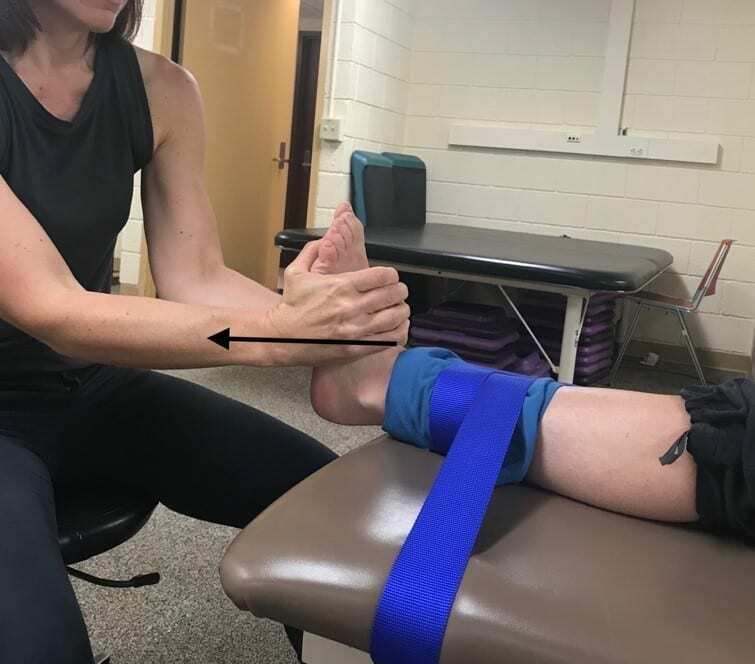 Results: The combination of joint mobilization and neuromuscular training (MTG) resulted in significant improvements in self-reported ankle instability (CAIT score) (p < .001), ankle dorsiflexion mobility (p < .001), and reach distance in the posterolateral direction of the Y-balance test (p < .032) compared to the CG and the TG. This study reported improved posterolateral reach distance in the mobilization plus training group (MTG) but no differences were seen in the anterior and posteromedial directions. Both the training (TG) and the mobilization plus training (MTG) groups significantly improved on the GRS compared to the CG (p < .001), but no significant difference was seen between the TG and the MTG (p = .423) This finding indicates that the overall perception of improvement was due to neuromuscular training. The mobilization plus training group (MTG) demonstrated significantly decreased PL activity during the starting and reaching phase of the Y-balance test in all directions; however no significant reduction in PL activity was seen during the reaching phase of the posterolateral direction. IAOM Commentary: Studies have shown that decreased ankle joint mobility plays a role in balance performance in patients with chronic ankle instability. Although the clinical effects of joint mobilization for FAI have not been demonstrated, short-term benefits of ankle joint mobilization on landing kinematics and postural control have been reported.7,8 The findings from this study reveal that adding TCJ mobilization to the treatment plan resulted in increased ankle dorsiflexion ROM. It remains unclear whether the improvements in balance and function can be attributed to the mobility gains or to the neurophysiologic effects of TCJ mobilization. Are improved function and stability measures due to increased ankle dorsiflexion ROM or improved neuromuscular control secondary to neurophysiological changes associated with joint mobilization? The authors propose that the increased dorsiflexion ROM in the combined treatment group may have allowed subjects to reach during the Y-balance test without the effort of the PL to prevent inversion of the unstable ankle during this task. Given that the PL contributes to the medial-lateral control of ankle motion, it is unclear whether the decreased PL activity following TCJ mobilization is a positive or negative consequence with regard to balance and function. Further research is needed to determine if an association exists between decreased PL activity and balance performance. Ultimately, the findings from this study support the addition of joint mobilization to neuromuscular training to improve balance and function in patients with FAI. Karas S, Mintken P, Brismée JM. We need to debate the value of manipulative therapy and recognize that we do not always understand from what to attribute our success. J Man Manip Ther. 2018;26(1):1-2. Bialosky J, Bishop M, Price DD, et al. The mechanisms of manual therapy in the treatment of musculoskeletal pain: A comprehensive model. Man Ther. 2009;14(5):531-538. Collins C, Masaracchio M, Brismée JM. The future of orthopedic manual therapy: what are we missing? J Man Manip Ther. 2017;25(4):169-171. Basnett C, Hanish M, Wheeler T, Miriovsky, D Danielson, E Barr, J, et al. Ankle dorsiflexion range of motion influences dynamic balance in individuals with chronic ankle instability. Internat J Sports Phys 2013;8:121-128. Hoch M, Andreatta R, Mullineaux D, English R, Medina McKeon J, Mattacola C, et al. 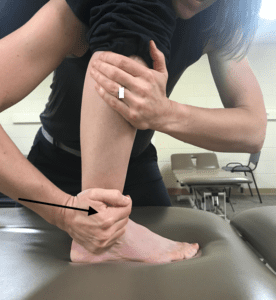 Two-week joint mobilization intervention improves self-reported function, range of motion, and dynamic balance in those with chronic ankle instability. J Orthop Res. 2012; 30:1798-1804. Hoch M, & McKeon P. Joint mobilization improves spatiotemporal postural control and range of motion in those with chronic ankle instability. J Orthop Res. 2011; 29:326-332. Delahunt E, Cusack K, Wilson L, Dohert, C. Joint mobilization acutely improves landing kinematics in chronic ankle instability. Med Sci Sport Exer. 2013; 45:514-519.